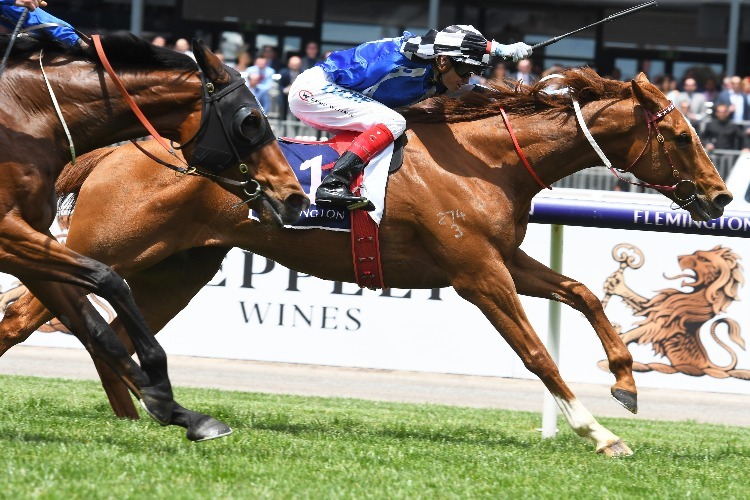 Top Prospect has broken through at Flemington for his first Australian win and could be on a path towards the Ballarat Cup. Trainer Darren Weir says a change in training environment has brought out the best in Flemington winner Top Prospect. One of three runners for the champion trainer in Saturday's Juvenile Diabetes Research Foundation Plate, Top Prospect had support in betting before scoring a strong win. Ridden by Craig Williams, Top Prospect firmed from $15 into $11 in a half-neck win over Etymology ($19) with Lycurgus ($41) three quarters of a length away third. A former New Zealand galloper, Top Prospect was having his sixth start since joining Weir's stable. Weir switched Top Prospect to his farm at Baringhup and was a little surprised by the victory, thinking he was still one run shy from being at his best. "Since he's gone to the farm he's really thrived," Weir said. "He wasn't an easy horse early on as he had a high head carriage but his manners are a lot better now and he's racing a lot better." Weir said Baringhup's rural setting provided a more relaxed atmosphere while the horses get plenty of work training on deep sand tracks at the property. Top Prospect is likely to be aimed at the Ballarat Cup on November 24 where he could be joined by fellow Flemington runners Pleasuring (fifth) and Lucky For All (sixth). "I thought Pleasuring ran well but I'm not sure about Lucky For All," Weir said. "He might nearly be ready for a break." Lucky For All's jockey John Allen reported the saddle shifted shortly after the start.